Whatever you think of Mary Oliver – popular poets are often criticised simply because they are popular – there are lines in this poem that can’t be dismissed as mere sentiment. I didn’t see any wild geese this holiday as they have all migrated, but there are still moments in this landscape that conjure the lines ‘the world offers itself to your imagination…. harsh and exciting — /over and over announcing your place/in the family of things’. We walk around with our cameras, snapping picturesque views and thinking we have captured the spirit of the places we visit; then we get home and the photos just look like pale imitations of the pictures we see in tourist glossy brochures, failing to reflect what we really felt when we stood in those landscapes. It’s also hard to paint pictures from these photos, as there’s too much information, we are seeing irrelevant details in the photos that we never saw when we were there: we can’t smell, feel or hear the atmosphere, and the colours seem all wrong, the light is too bright or the shadows too dark. 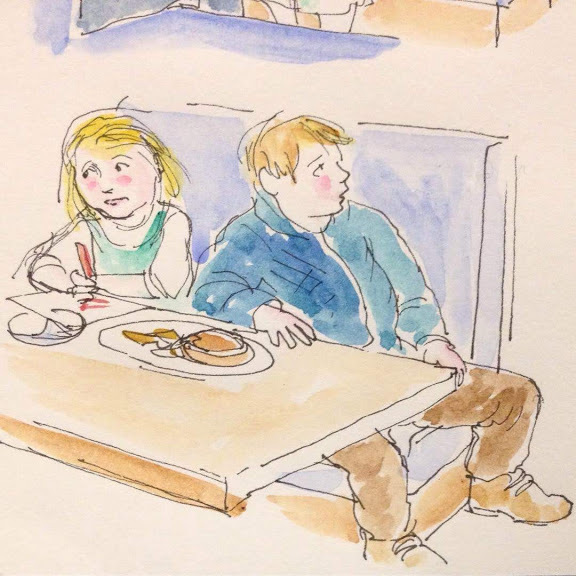 I have been using a camera with two high quality lenses, but I’ve been making many of my watercolour sketches using fuzzy iPhone pictures, working from memory, or from pencil sketches. The picture above the poem – Revelstoke viewed from Mt Begbie Brewery – was painted with the aid of a very poor iPhone photo taken as the light was fading. The bald eagle below was painted using two photos that we took ourselves, one with a top of the range zoom lens and the other a slightly out of focus one taken with a shorter zoom lens. The second photo was more useful than the first, as it stopped me fussing over the detail. We saw a mule deer rush past us just below the Juniper hotel and restaurant, where we’d just had the most spectacular Canadian breakfast. I only caught its rear end with my camera, so felt compelled to go to Google to get more detailed reference for its head and antlers. But I didn’t want my painting to be too realistic, so I created a semi abstract forest, using sepia and indigo with a pale wash of cadmium yellow and orange to signify the sunshine filtering through the trees. I think perhaps a deer caught leaping in mid air by the camera is a bit strange when transferred to a painting, and the composition isn’t quite right – the deer is too central – but I like what the trees are doing. I think I did a bit better with this concept: I began with a drawing from my hotel window. The magpies were flitting past, too fast for me to see in detail so I just scribbled shapes in the sky to give me an idea of their scale against the mountains. Then I consulted Google to get a better understanding of their wings and tails in flight. I’d taken numerous shots of the view but the only information I used from the photos was the colour of the right hand peak, as it caught the last light of the sinking sun. I also gave the trees more snow than they had that night when I drew them. All my sketches are very small, less than A4 or in some cases smaller than A5, but I want to do much bigger pictures when I get home, to do justice to the landscapes; however, that doesn’t mean I want to cram them with details. My final picture was done entirely from memory, and I wrote a little haiku to go with it. It complements the first picture, which is a view back towards Revelstoke from the road that leads to Rogers Pass; this time we were returning via the same pass, and the lights of Revelstoke were illuminating a cloud that was rising from the valley. My kind of holiday is having the opportunity to absorb a landscape, without being rushed from one country to another, or even whirled around museums and art galleries in just one city. Adjusting my pace to the daily routine of two small grandchildren focuses my concentration on the environment even more: our 8 month old follows the flight of a raven with the same fascination that she directs towards people’s conversations; our two and a half year old samples the snow with his mouth and nose, rolls in it and buries himself in it. The snow has transformed landforms that I thought I knew fairly well after my last visit in the summer of 2016 into monochrome stage flats; the dark forests on the lower slopes are now either swathed in white or greyed out by a peppering of half melted snow. The kitchen window continues to be a never ending source of inspiration: the mountain appears and disappears throughout the day, and I can at least make quick sketches here without freezing my hands off. I’m learning to spot birds silhouetted in the leafless deciduous trees and against the grey, often sunless sky. I’ve seen the prints of a weasel and caught the flash of a squirrel running along the top of our snowy fence. And today I had the treat of a lifetime: we spotted two bald eagles roosting above our heads as we walked back from a shopping expedition. This was just after I had resolved to paint a watercolour from memory of another bird I had seen and managed to identify by the white spot on its back: a Northern Harrier. There are no Google photos that I could find of a harrier flying away from the viewer, but that was the view I had when I spotted it, and I decided that I needed to created the whole scene from my head rather than concoct it from my own photographs of the landscape. It may not be an authentic representation of a harrier, but it captures what I felt when I saw it. The other three pictures all use photographic reference to accurately depict a chickadee (spotted in a maple tree), a raven (they are constantly flying over our heads) and a short tailed weasel in its winter coat (I still haven’t seen one, but I know how to identify their tracks). The settings are derived from photos I took, and in each case I tried to keep the landscape detail to the minimum, focusing on the subject. I am continuing to use mainly washes of Winsor and Newton sepia and indigo, which produce a wonderful range of blues, browns, blacks and greys. I have always tried to keep a diary when on my travels, as I find it very hard to recall the day to day happenings. 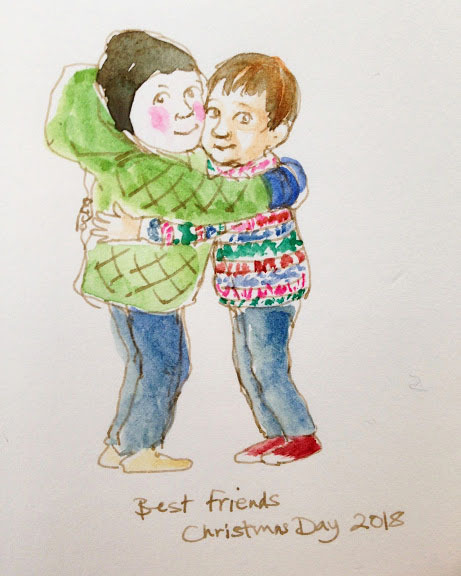 In my last Sketchaday series I wrote a post nearly every day, but this time I seem to have less opportunity – I am doing a lot more hibernating in the evening, and two active grandchildren keep me busy for at least part of the daytime. So I am practising the art of visual recall. Instead of sketching on the spot, I try to remember as much as I can about the scene in front of me and then draw it afterwards. 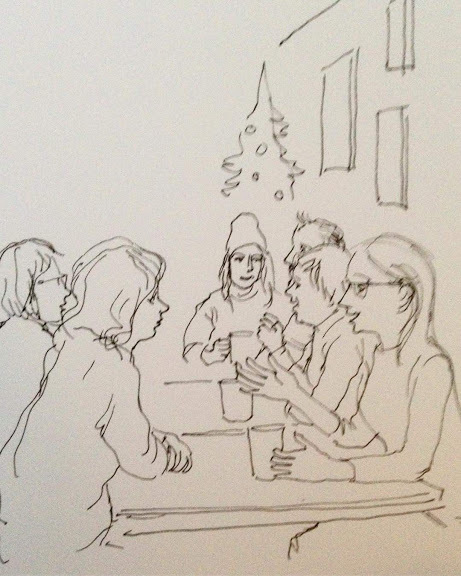 After our first skiing lesson, on Boxing Day, we had an après ski session at the Rockford. Behind us sat a very happy small girl, dressed in a princess outfit with a tiara on her head. A little later her brother sat down beside her, looking a little bored. She seemed out of sorts after this, until both father and brother disappeared on a mission of their own. She then disappeared – almost – under the table, and started a new game of her own, undisturbed by prying adults. I drew the characters and most of the layout from memory, then referred to a photo I’d taken to remind me of the colours and the architectural detail. 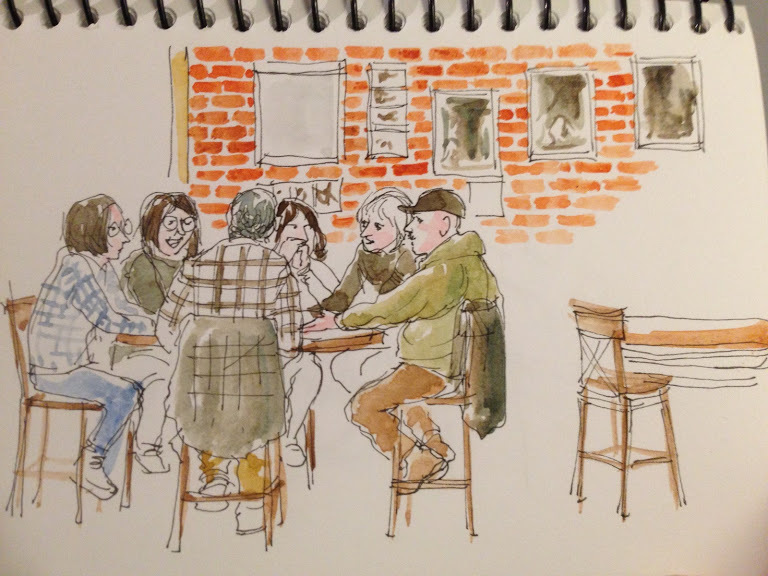 These two sketches at the Conversation Café are before and after I checked the photo I got most of the people more or less right. but I’d drawn the pictures on the right in portrait format, when they were actually landscape! 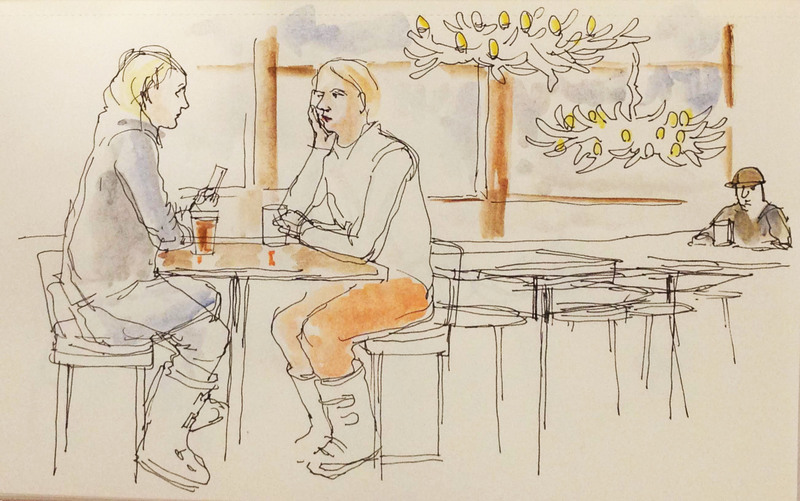 The sketch on the left is my memory of customers in the Modern Café, which I sketched from outside in 2016. I added some colour from memory, and then remembered the figure at the back, consulting his phone. The figures behind him were invented. The only thing I forgot was the zombie – the little fellow on the table identifier in the foreground! I also enjoy trying to remember individual characters. 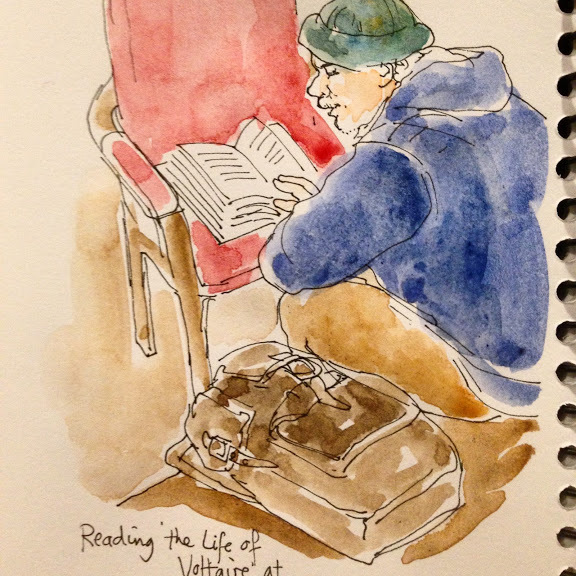 The fellow on the left was sitting next to me in the Modern, absorbed in ‘the Life and Times of Voltaire’. I couldn’t photograph him without appearing rude, so I had no way of checking my accuracy. But the fellow on the right was quite a long way away from me at the ski lodge, so I sneaked a photo of him. 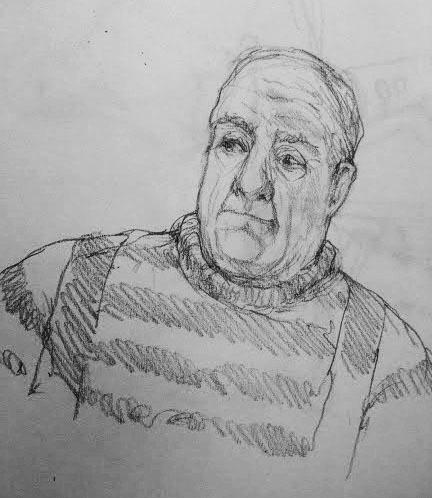 The second pencil sketch was the one I did from memory, before I checked the photo. 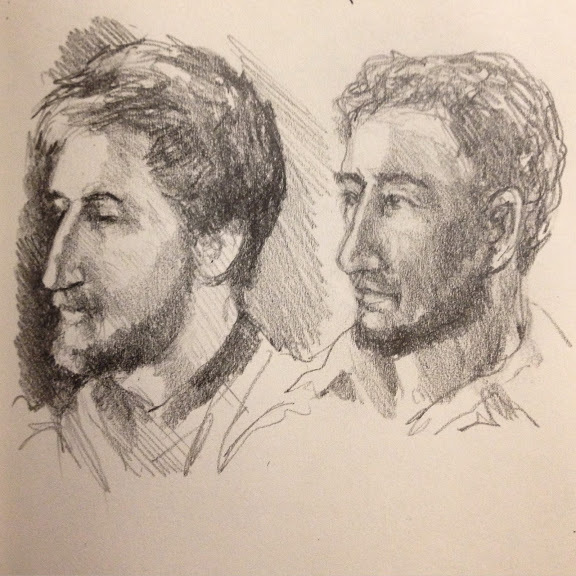 The first pencil sketch was drawn afterwards, directly from the photo. 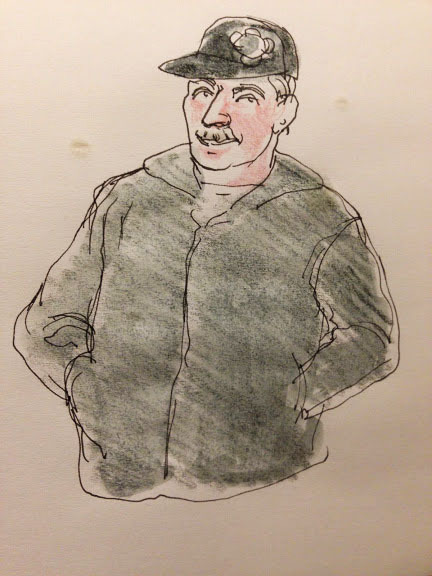 I had greatly underestimated the distinctive character of his nose in my first sketch – and I hadn’t added his beard until I checked the photo! 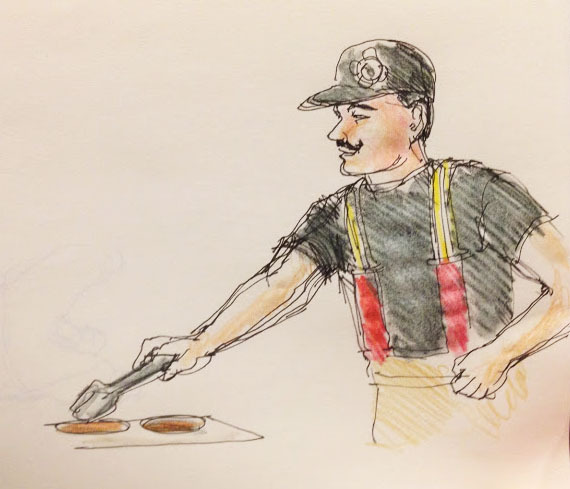 These are a few more examples of memory drawings: a veteran skier, two younger skiers enjoying an après ski in the Mackenzie Common Tavern, and three fire fighters assisting at the barbecue which was laid on at the fire station for people delivering their Christmas trees to be chipped. The Chinese/Japanese approach to painting is to sit and observe a scene for a long period, then to go away and paint it. I’m nowhere near that stage of achievement yet, but I’m attempting to simplify and modify the paintings I make from my photos so that they more closely resemble the image in my mind’s eye. It was drawn entirely with a fountain pen that contained sepia water soluble ink, that I blurred in places with a wet brush. It looks very like the photo I took, even though it’s been done entirely from life. I ran out of sepia ink shortly after I made this drawing – I had left the bottle behind in case I broke it in transit. The second attempt was from a photo of a very complicated landscape: this time I focused on the foreground tree and greatly simplified the mid ground detail, using sepia and indigo Winsor and Newton watercolours. 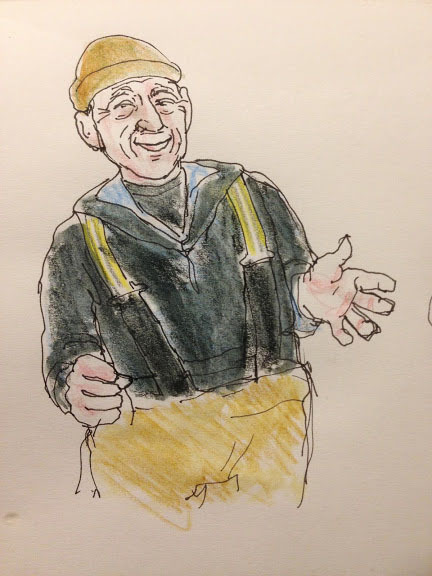 I discovered that I could dilute the sepia watercolour and use it in my pen, just like the water soluble ink. I drew this in my little A6 4 x 6″ cartridge paper sketchbook and was quite surprised at the degree of punishment the paper was able to take in terms of soaking. I then tried two paintings using a wash of indigo, in two or three different strengths, on Saunders rough. Both paintings were less than A4 size. This scene I didn’t even conceive until my husband pointed out the figures on the far bank, and I was able to capture the image with our zoom lens. 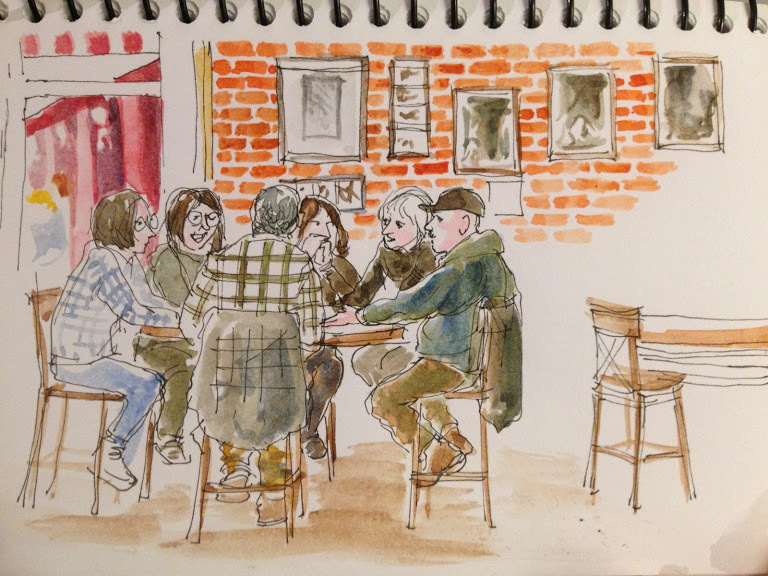 It’s a very simplified version of what the camera saw, painted in my Moleskine watercolour 21 x 13cm (5 x 8″)sketchbook. I added the reflections of the figures as this was what the camera was indicating, although I wasn’t sure whether they were really reflections or just blurred images of the foreground plants. I’m not sure whether the reflections are needed in the painting. Finally, I drew this in my new Fabriano 7 x 9″ cold press sketchbook, from the kitchen window – except I had to move, because people needed to get at the sink, so I finished it by working from my iPhone. The iPhone kept turning the image off, plus the photo wasn’t the same as my memory – the mist had lifted when I took the picture – so it wasn’t very helpful. I also edited out the power lines. I think it might be the best compromise so far between working from memory and working from photos. 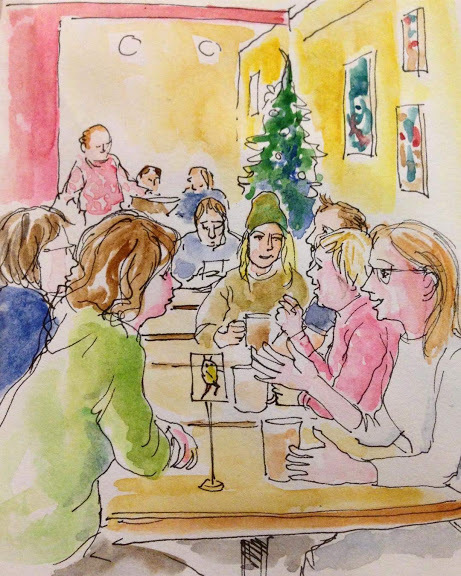 But then there’s this one… painted from a photo, also made in the sketchbook. I cropped the photo and lengthened the composition, trying to portray the essence of the dog’s delight in ploughing through the crisp snow on a sunny morning. I’d love to receive some comments on which paintings work best, and why. Each one of them signifies a personal moment for me, but they may not all be as effective for other viewers. 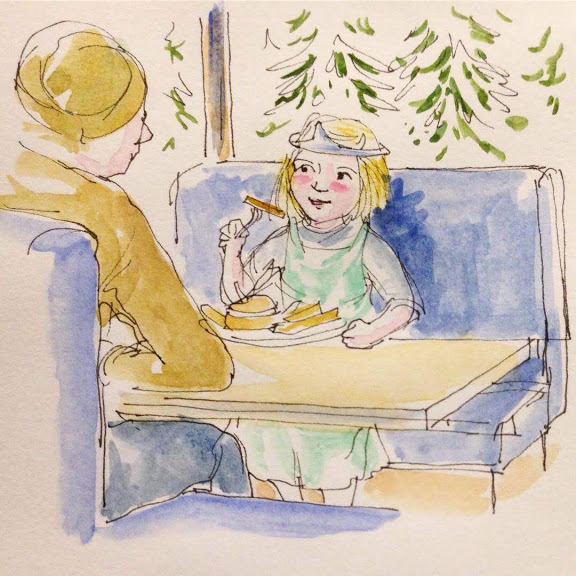 After arriving at Revelstoke on Dec 14, we were caught up in a whirlwind of family activities, so I now have to choose my moments to note down a scene from each day. We take plenty of iPhone pictures, but I am training myself to remember what I see as much as possible. This scene from the cookie party took place while I was watching the baby and engaging in conversation with some of the mothers, and there’s a bit of a story here: the child on the right is a boy, clearly enjoying the dressing up as much as the girls are. These are all memory sketches from the past week. I try to draw straight in with the pen, as it focuses my attention on the essential details. Sometimes I start with a fountain pen filled with sepia ink, so I can reinforce detail afterwards with a waterproof black pen. 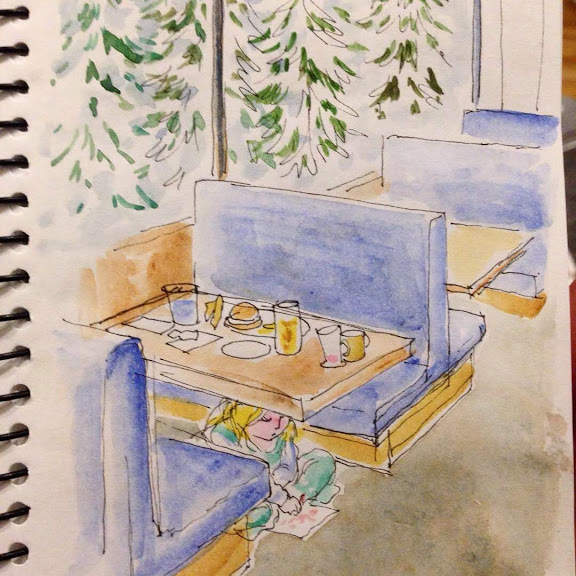 The watercolours are Cotman, from a small travel set of pans. I could only remember the colours on Leo’s pjs in the last picture because we discussed them in detail – emerald, viridian, turquoise, sap green and ‘tree green’. The two drawings below are memories of characters I encountered on our daily excursions. The girl with the mermaid tattoo was at McDonald’s, a haven that our two year old is determined to reach through the thickest carpet of snow, for his ration of ‘hashies’. I used a photo to remind me of the background, but the figures are all sketched from memory. This man at the Christmas market was very persuasive. The Haskaps – the fruits he makes his compotes out of – obviously aren’t available fresh until the spring, but the way he described them I could imagine their taste on my tongue. So the fruits on the counter in front of him are just a photo! If you want to try them, contact Axel here. A lovely review of our Christmas concert by J V Birch. In case you didn’t know, I co-run a monthly open mic (first Wednesday in the month) for poets and musicians which usually takes place at Moana Surf Life Saving Club – but we occasionally move around, and we do two Saturday concerts a year, featuring some of our regulars as well as guest performers from other parts of South Australia. J V Birch was our guest poet – and she was formidable.